one occasion he asked T.V. Subrahmanya Ayyar, who had great devotion towards the Maharshi, "There are three lingas here, do you know?" Seshadri: The third lingam [?] is known as `Seshadri'. In order to facilitate dhyana [? ], a Sastry of Chidambaram used to resort to opium though the Maharshi advised him against it. On one occasion as the opinum was not pure, the mind of the Sastry became perverse and all sorts of thoughts sprang up. Not knowing what to do, he ran to the Kambathu Ilayanar shrine and waited for Seshadri. As soon as he came the Sastry prostrated at his feet and even before he could say anything the Sastry was admonished thus: "I had already advised you against using the drug but you persisted." These were not the words of Seshadri, but of the Maharshi. 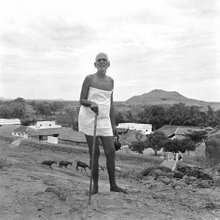 The Sastry realised that Seshadri said those words to demonstrate that there was no difference between him and the Maharshi. Whether Seshadri worshipped God with attributes or without attributes is dealt with in the chapter on "Giripradakshina". It is shown therein that he appeared to have had devotion to the Lord with attributes. He also demonstrated nirvikalpa samadhi. Hence it may be appropriate to conclude that he worshipped the Formless One also. One day, Seshadri stood watching a buffalo in the agraharam. V.C. Narayana Ayyar came there and asked him what he was looking at. Seshadri said "This." Ayyar asked him if he was referring to the buffalo. Seshadri turned towards him and asked him to tell him what it was. Ayyar replied, "It is a buffalo". Seshadri said, "Is it a buffalo? You beast, you had better refer to it as Brahman" and walked away. Recollect the upadesa of Seshadri to Natanananda also in this context.